Experience Engaged at Work: A Right-Brained Approach, a unique workshop that taps the creative, feeling, image-driven, right-side of the brain. It is often underutilized at work where statistics, rules and procedures are the norm. Employee dis-engagement is not a statistic; it’s an individual and cultural reality. Through images and hands-on creating of collage cards, this workshop focuses on the root causes of those feelings, allowing each person to find their own counsel and direction. Workshop participants take their collage cards with them as a visual reminder of how to stay engaged. The feedback has been overwhelmingly positive and encouraging. A few examples of client reviews are shown below. Please contact MMSoul using the form on the Home Page to schedule a custom workshop. You must experiene this workshop to understand why it's so successful. Looking forward to seeing you! According to a 2015 Gallup poll, practically two-thirds of employees are not engaged or are actively disengaged. That is too many! There are countless books and articles outlining the costly effects of disengagement, and so we will not go into detail about that here except to say that we believe the impact is as debilitating for the individual as the company. Addressing employee engagement is a win-win proposition. When one looks at the root causes of employee disengagement the problem can seem overwhelming and hopeless. That’s because today’s work-life is draining: we face many challenges all the time. Tony and Megan propose that instead of looking at what we cannot change, let’s focus on what we can. People can learn to feel better about where they are. It has been proven throughout history that people who face horrible hardships find a way to inner peace and perseverance. Employees, therefore, can find ways to become more engaged at work despite the hardships there, too. There is both an individual and group component. The majority of the time is spent independently creating collage cards, but there is also time for participants to share their cards with the group. They often glean even more from their cards as they talk about them out loud. There are three basic steps to the workshop: select images, create cards and share with the group. This is accompanied by thoughtful facilitation by Tony Hansen and Megan Menkveld whose unique combination of experience and expertise provide a safe, calm, growing workshop environment. Images are already in the workplace: emoji's substitute for text, photo frames sit on desks and affirmation memes hang on walls. Employees use images to help them emote, communicate and self-validate already. E@W leverages this existing interest in and use of images. 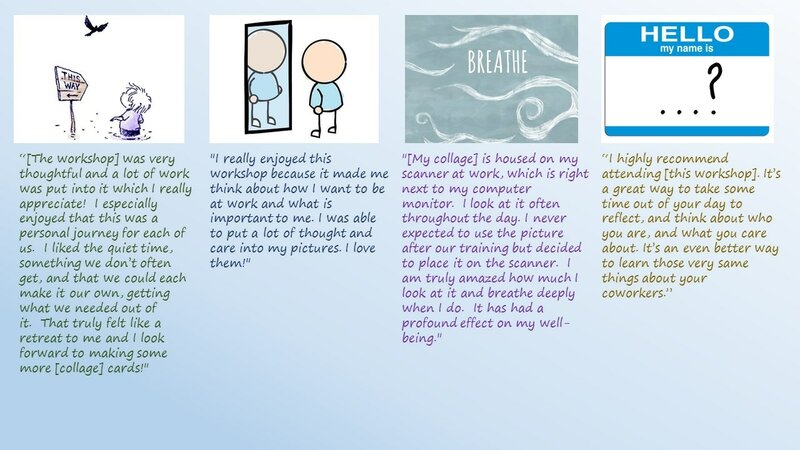 ​At an E@W workshop, images are used to help participants reframe how they see their workplace realities. Once they make their image selections, participants write a statement about what those images are emoting, sharing or otherwise intuitively guiding the creator to know. It never ceases to amaze Tony and Megan at the love participants have for their collage cards and their receptiveness to the messages, so much so that most end up being prominently displayed in their creator’s workspace after the workshop. The cards serve as visual cues to reinforce the message long after the workshop is over. Participants specifically appreciate the quality of images from which they get to chose at an E@W workshop. Receiving unsolicited comments like, “I can see you take great care in gathering images,” and “I’ve done collaging before but the images weren’t anything like these – they’re all gold!” is very rewarding and motivating. Each image is carefully chosen for emotive potential, diversity and variety. It is then manually cut from the used book or magazine, trimmed and sorted into five categories for easier participant selection. Custom workshops are a minimum of $800, or $80 per participant if over 10 people, with space and furniture provided by you.